5 Bed 3 Bath Just Rented! Raised ranch with rocking chair porch. Larger than it looks. Approximately 1700 sqft on main floor alone. 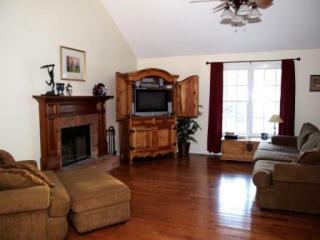 3bed 2bath on main level. 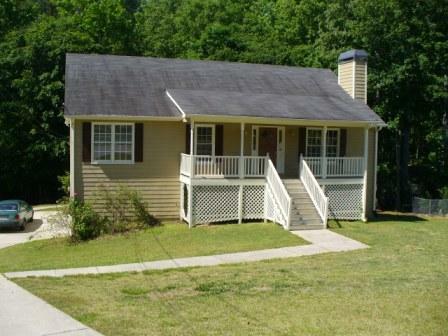 2bed 1bath with den in basement with 2 car garage and storage cabinets. Wood burning fireplace (with gas starter). Fenced area in back yard. Vaulted ceiling in family room and tray ceiling in master. Garden tub and stand up shower in master. 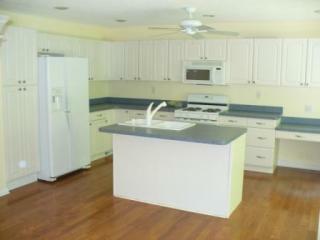 Hardwood floors in open floorplan kitchen, dining, family room and hallway. Must see! Available September 1st! Thanks! We used to live there, we moved so that my business would be more visable, and put a lot of work into the house before we moved. If you know anyone looking please call or send me a pm. We would really like to get it re-rented quickly. If anyone is looking at buying we would also consider selling. I saw a similar kitchen in a magazine and copied it. The room is open to the dining room. It is so easy to get to everything. There can be 5 people in there working together and they all have room. Refreshing for reduced price!!!! Now Available!!! !